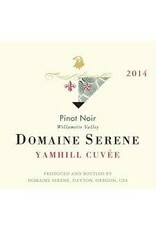 This Willamette gem was recently selected to be the face of Oregon Pinot camp. Yep, that means that this is the embodiment of Willamette Valley and the superb Pinot Noirs they have become famous for. Receiving 91 points from Wine Spectator, we understood all the hype at first taste. Rich with aromas of Bing cherry, blackberry, dried herbs and spices that stretch to the palate and deliver some intense red fruit. This wine is graceful and polished, seamlessly integrating playful tannins with spicy notes. Silky, elegant, and simply incredible!